Истекает 11 июня 2020 г.
Истекает 19 июня 2020 г. Celebrating their 13th year anniversary in 2018, HYPER by Sanho Corporation is a dynamic company based in the Silicon Valley of California. They specialize in delivering cutting edge IT & mobile accessories with a focus on Apple, portable power, data storage & connectivity products. 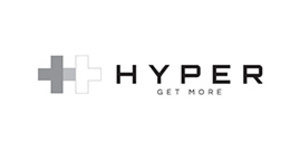 Their award winning products include the HyperJuice (MacBook battery pack), Pearl (Compact Mirror Battery Pack), HyperDrive (Data storage & connectivity), iUSBport (World's 1st wireless USB port), HyperVR (Virtual Reality headsets with integrated headphones), HyperLink (Apple Watch bands), HyperThin (World's thinnest HDMI cable) and HyperShield (Cases & Stylus).